When schedule information is disappeared. Chek the following settings. Schedule information in Jorte would not be disappeared unless it is intentionally deleted. When [Google Calendar] mode is set, Jorte calendar is not shown. When [Jorte Calendar] mode is set, Google calendar is not shown. -> Choose the calendar mode that has been used. Schedule information is not shown when [Holiday] is set. Schedule information is not shown if background color and font color are same. Schedule information is not shown if background color and font color set at Google Calendar side are same. By long tapping the date, selection of the background and optional holiday setting is possible. Color of the letters can be changed by tapping [■] near the title when using Jorte Calendar mode. Name of colors can be changed by[Options] -> [Select Calendar] -> [Title Text Color Name] . Multiple calendars can be managed by color at Google Calendar. Sharing a calendar among staffs at company and family members is possible. 1) Click Menu button at Jorte Screen. But setting of Google Calendar at PC(Web) is necessary. To transfer schedule information from Jorte Calendar Mode to Google Calendar Mode. * Perform this function only once. Because this performance adds data. To synchronize Jorte with Google Calendar, setting on Android is necessary. Be cautious about the following matters when using Google Calendar Mode. * It is not necessary to use [Data import & Export] -> [Copy data from Jorte to Google] function when using Google Calendar Mode. This function is made to copy schedule information from Jorte Calendar Mode to Google Calendar Mode. This function is performed only once. * Even above procedure is performed but new schedule data is not reflected to the PC(Web) Google Calendar, please check if right calendar is selected. * When using HTC and SAMSUNG etc..., it is not reflected to the Google Calendar on the Web because the default setting is "My Calendar". When using HTC and SAMSUNG etc..., select the calendar to be synchronized by performing "[Menu] -> [Options] -> [Select Calendar] -> [Default Calendar]". ■"Synchronization does not complete" "Facebook events synchronize" and "Holiday information overlaps"
With a portion of Android model, inquiries such as "Synchronization does not complete" "Facebook events synchronize" "Holiday information overlaps" also come up. Above problem might be caused by pre-installed standard calendar application. Please check the following if you are at Google Calendar Mode on Jorte. If these settings are set at [My Calendar], pre-installation is already done. Jorte does not synchronized because it is our original standard calendar application and it is local. Cancel the setting of my calendar at standard calendar application. * "There was an error while synchronizing your tasks to Google Tasks. Please try again later." Instability of Google Account might be the reason of this error. Check to see if log in from Android Market, G mail and others are possible. Error message also appears if synchronization is done by hand while automatic synchronization is occurring. * "The application Jorte (process jp.co.johospace.jorte) has stopped unexpectedly. please try again." The cause of the above error message might be that Jorte's security setting for Tasks synchronization is not "allowed". "Allow" security setting by [Menu] -> [Synchronize]. * Error message appears if CSV format is not adaptable with Jorte's CSV format when taking in CSV files to Jorte Calendar. * Error message also appears if numbers of letters to be transferred is not adequate when schedule information is transferred from Google Calendar Mode to Jorte Calendar Mode. * Resident application might slows down starting up and Jorte might be forced terminated. * Error message might also appear when Jorte and other schedule related applications are managed simultaneously depending on schedule status. * Jorte does not start up when "Calendar.apk", "CalendarProvider.apk" and Android standard calendar application are deleted because of route acquisition at Android. ■Q1: What is main features of this application? Because it running on Android terminal, you can carry it in your pocket, also you can operate with one hand, you can check schedules while walking, input schedules smoothly when you go out. You can select monthly or weekly view. You can mark it with red color or put to pick up list about your important appointment. You can recognize at a glance appointments which have already finished. You can manage Tasks list. You can set the beginning day of the week. You can export and import appointment data as CSV file. You can select Google Calender or Jorte Calender. You can show it as widget on home screen. ■Q2: Where can I download this application? ■Q3: What kind of terminal can we use? Android terminal. We have checked operation on "HT-03A", "Nexus One", "XPERIA", "Motorola MILEST ONE (Droid)". ■Q4: What is Jorte Calender in Option? This mode is used only by Jorte. It has basic functionality, and do not share it data with another service at the moment. In the future, there are plans for a tool that will edit events and to-dos from a PC. ■Q5: What is Google Calender in Option? This mode uses Google's calendar. It allows setting reminders and repeating events. Take single tap [Open Detail] when you input appointment on Google Calender Mode, there is notification item. But you can not use this funciton in Jorte Calender Mode. You can always switch between those two modes (but they can not displayed at the same time for now). ■Q6: What is Calender in Operations? You can set an arbitrary day as public holidays or holidays with a long tap on the date. To move to the next or previous calendar, slide the calendar sideways. Tap the header, Date search window opens. 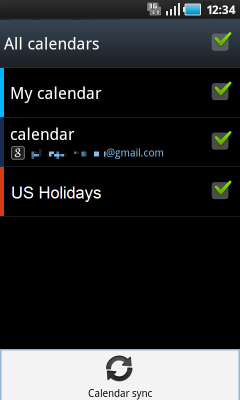 ■Q7: What is Calender in Customize? [First Day] ... Set the first day of the week for weekly view. [Event Background Color] ... Select a Background Color for days. [Font Size for Event Titles] ... Select a font size for widgets. [Display Completed Event] ... You can set the display of complete Event. [Event Display Order] ... Select the order in which to display events. ■Q8: What is Google Calender in Settings? [Set default reminder] ... Serect default reminder. If you do not need the notification [None] is set to please. ■Q9: How to configure holidays? This item is at the bottom of Data Import&Export menu, scroll to the bottom when you cannot find. ■Q10: What is Tasks & Memo? This is a Jorte only mode. And, This mode syncs with a Google Tasks. Switch between modes. ■Q11: What is Tasks & Memo in Operations? Frick to change orders, distinguish between finished and unfinished, and whether it's important. To move to the next or previous Tasks list, slide the list sideways. ■Q12: What is Tasks & Memo in Customize? [Task Account] ... Select which task account to use. [Use Auto Sync] ... Select whether to auto sync calendars. [Task filter] ... You can set the display of complete Tasks & Memo. [Task on the calender] ... Select to enable the display of tasks on the calendar. ■Q13: What is Google Tasks in Settings? This version supports only manual synchronization. Security Settings screen displays. Jorte set to allow. You can show applintments "Calendar" and "Tasks & Memo". And you can show it in weekly view. ■Q15: What is Widget in Settings? [Choose which widgets to display] ... Select which widgets are available. [Widget transparency] ... Set widget transparency. [Font size for widgets] ... Select a font size for widgets. * When application are moved to SD card, Widget can not be used. ■Q16: Can I output appointment data in Jorte Calender into file? Using [Options] -> [Data Import & Export] -> [Export Appointment], you can output as csv file to specified place. And you can import csv file. You can select overwrite import, or additional import. You can not use this function in Google Calender Mode. ■Q17: Can I output Tasks & Memo data into file? Using [Options] -> [Data Import & Export] -> [Export Tasks & Memo], you can output as csv file to specified place. ■Q18: Can I delete all Jorte Calender appointments? Using [Options] -> [Data Import & Export] -> [Clear Jorte Data], you can delete all appointments. this item is at the bottom of Data I/O menu, scroll to the bottom when you cannot find. You can not use this function in Google Calender Mode. ■Q19: To hide the software keyboard? Push [<-] button on your Terminal. ■Q20: To view the calendar during a call? Push [Home] button on your Terminal. ■Q21: Can you set a default time that isn't 12:00? ■Q22: I went on a trip. The times do not match up. Android Please check the [Select time zone] settings. Please reboot your phone for these changes to take effect. * Google™, Google™logo, Android™, Gmail™, Google Calendar™, Google maps™, Google Talk™ logo and, Google calendar, Google Tasks™, Google Voice is a trademark or a registered trademark of Google Inc.
Copylight(C) Johospace Co.,Ltd. All Rights Reserved.